ore than a hundred SLTB buses which were deployed during the strike by private bus operators on Friday had been pelted with stones apparently by the strikers at various places in the country. It left 22 SLTB employees and eight passengers injured, one of them in a critical condition. Police said they had arrested more than 50 miscreants allegedly involved in the attacks on the SLTB buses. This shows one of the darker sides of the mindset of trade unions in our country. Trade union action today is not being used by workers to express their protest or frustration over their grievances not being addressed by the authorities, but to pressure or embarrass the authorities by harassing the people and even putting their lives in danger so that they could have their problems addressed. It has come to such a situation where trade unions measure their success by the number of people harassed, made to suffer or put in danger. During a transport sector trade union action the striking workers believe that thousands should be stranded at bus terminals and railway stations, in similar fashion more patients must be harassed if a doctors’ strike is to be considered as successful. Somehow these trade union leaders surreptitiously tie up their struggles with the concerns of the masses. Doctors while on the one hand are fighting for duty-free vehicles have on the other hand the audacity to say that they need those vehicles to serve the people better while private bus operators unfailingly claim that their work stoppage is meant to provide the people a better transport service. Both these claims are utterly false. 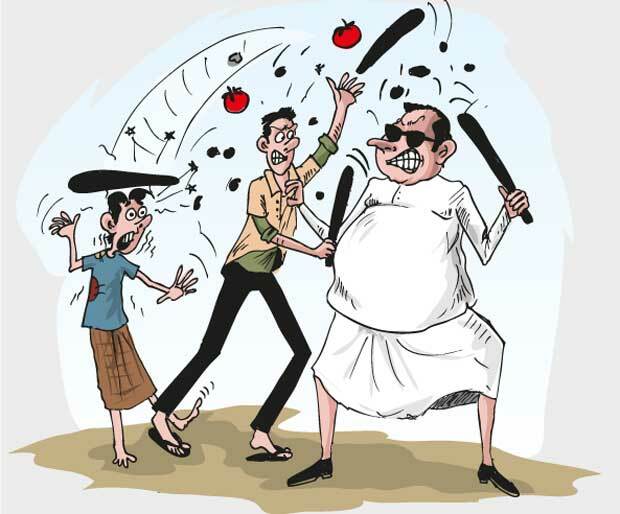 A few months ago a JVP-affiliated trade union federation threatened to besiege the Colombo City by blocking its main exit points to highlight several of its demands. Needless to say, that the trade unions which represent the working masses have the right to fight for the rights of the workers. However, they must understand that they do not have the right to harass other people and endanger their lives by blocking roads or stopping work. Attacking buses during the bus strike is an extension of this selfish, cruel and warped mindset and those responsible should be brought to Courts and severely punished. As far as the current controversy with regard to the fines imposed on the errant drivers by the government through the 2017 budget is concerned, the move seems to be a means of increasing government revenue rather than enhancing road discipline, when you take into consideration the manner in which fines were introduced through the budget without prior discussions with the stakeholders. However, the professed objective on face value cannot be contested. Road discipline is a must in a developing country. Driving a vehicle today on a main road, leave alone the main cities and towns, is often a nightmare. Millions of man hours are wasted on the road daily because of traffic snarls. But some of the offences listed as warranting heavy fines seems impracticable. For instance, a vehicle driver would be fined Rs.25,000 for overtaking another vehicle from the left.This cannot be always treated as an offence because many drivers are compelled to do so because of reckless driving by some while the proposed fine far exceeds the basic salaries of most drivers. There is also the possibility of the revenue envisaged by the government ending up in the pockets of unscrupulous cops. Reckless driving is only one factor in the declining road discipline. There are other factors as well to be considered such as lack of proper development of the road network and the use of modern technology in the field. It is true that the authorities cannot allow road discipline to deterioriate until the road network is developed with necessary technology. Therefore only a healthy dialogue among the stakeholders would help solve the current problem.